“Slap Tagging” is a new trend that makes vandalism quick and easy for taggers. Walnut/Diamond Bar – On August 23rd, Deputies from the Walnut / Diamond Bar Sheriff’s Station arrested a 23 year old man for possession of vandalism/graffiti tools. 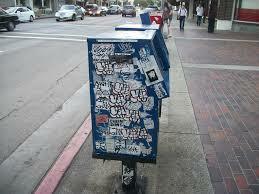 The tools of the trade today are nothing more than a blank postal label decorated with graffiti. 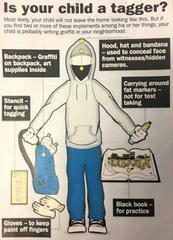 It is called a “slap tag” they are commonly used by taggers/graffiti artists to quickly vandalize public or private property with less of a chance of being caught. They decorate dozens of them before they hit the streets and then all they have to do is peel and stick. A message for parents: Above is an example of a “slap tag”. The mere possession of these items is a crime, and could land someone in jail. The second image is an example of common “tagger” items. Parents, please it is important to become familiar with these items and make sure your son/daughter doesn’t have any similar items. If you do find these items please destroy them immediately and explain the dangers this can cause to your child. The fine could be the least of their worries; an encounter with an angry property owner could lead to criminal charges for either. To the taggers/graffiti artists; just think about somebody other than yourselves and go to an art gallery if you are that talented.